Global airline traffic is estimated to grow to 12 trillion Revenue Passenger Kilometers (RPKs) by 20301. Is your network optimized to maximize today’s opportunities for customer traffic, as well as to capture the anticipated traffic growth? Price is not the only lever available for increasing customer traffic. Having an optimal network plan ultimately determines how much traffic can be accommodated inside a network and what the revenue potential is for a carrier. Am I flying to the right markets? Am I maximizing my alliance and codeshare relationships? Are my connection times at hubs as optimal as they could be? Is my fleet planning optimized to maximize revenue? These are four of the foundational questions that airlines should be asking when determining how to develop their network to maximize potential revenue. Growing customer traffic while also growing revenue in a tight market is difficult, but not impossible. There are many levers in addition to price that can help positively influence customer traffic. Optimizing your network is one area that can help provide a relatively quick impact. You can find hidden opportunities within your network for profitably driving additional traffic by addressing the following four questions. Am I flying to the right markets? Determine the most profitable new market opportunities to pursue. Am I maximizing my alliance and codeshare relationships? Fully leverage your partnerships to capitalize on and grow passenger demand. Are my connection times at hubs as optimal as they could be? Ensure your flights have the most optimal hub schedules to increase your passenger demand and total network connectivity. Are my fleet planning activities maximizing total network revenue? Optimize your fleet plans to maximize revenue while maintaining the operational integrity of your schedule. Determine if you are flying to the right markets to maximize customer traffic and revenue. You can easily evaluate the profitability of your schedule and ensure you are flying to the right markets with Sabre® AirVision™ Profit Manager. Profit Manager is a powerful decisions support tool that allows airlines to perform various “what-if” scenarios ranging from new market analysis and codeshare/alliance modeling to measuring the impact of your competitors’ changes on your network. Forecast new market profitability, maximizing passenger connections. Model your cost structure by performing “what-if” analysis on all of your costs to determine how these cost changes impact profitability. Create a schedule that maximizes customer connectivity, thereby increasing the number of destinations available. By entering into a partnership or one of the major global alliances, your airline can further extend its reach and enhance its brand. However, the process to enter into these agreements requires a significant amount of effort, and can be very difficult to ensure that the agreement is beneficial for both parties and will lead to a profitable increase in customer traffic. Through Sabre Airline Solutions® consulting we can take a holistic approach that will provide you with strategic and tactical recommendations. Our airline partnership experts have helped airlines from around the world create unique partnerships based on business need, as well as helped airlines work through the process of joining one of the major global alliances. You can drive incremental revenue by making intelligent schedule adjustments that maximize customer connectivity. Determining the optimal customer connection times historically has been a difficult and often overly complex process. Sabre® AirVision™ Network Manager is a global schedule optimization system designed to remove this complexity and help airlines optimize flight connection timing. It considers operational constraints and customer preference to offer schedule alternatives that maximize total network revenue. Develop a schedule that maximizes customer connectivity and minimizes missed connections. Consider customer behavior to determine optimal departure times. Consider operational information such as slot / gate availability and aircraft inventory. 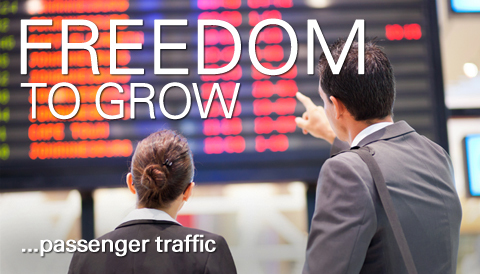 Flying to the right markets at the right frequency is only one step towards growing traffic. Without the right equipment operating on these routes, it is difficult to realize your potential in terms of customer traffic. Sabre® AirVision™ Fleet Manager is a global schedule optimization system used to make fleeting decisions that maximize total network profitability. You can make optimal fleeting decisions by utilizing its patented O&D optimization technology that models passenger flow across the network so that capacity is assigned and revenue managed according to the same information. A large South American national carrier faces heavy competition in region and has concerns about the potential impact on its market share and profitability. Identify and prioritize potential new alliance and/or codeshare agreements it can enter to counter expected losses from competitor merger. Forecasted various scenarios to measure impact of merger and potential responses. Forecasted negative impact to carrier from competitor merger. Identified potential partners in region and developed potential scenarios. In these three scenarios, the carrier’s overall passenger revenue forecast to increase by 2.4% - 3.8% versus base (or 6.0% - 7.4% versus post-merger scenarios). A South Asia-based low cost carrier operating ~20 narrow body aircraft and looking for fast implementable and tactical solutions to improve traffic and revenue. Optimize the upcoming seasonal schedule by conducting a consulting engagement that would analyze possible network adjustments and tactical opportunities for growing traffic and revenue. Identified and cancelled a loss-making route. Added four additional daily flights to relevant, profit-generating routes made possible by utilizing extra capacity created through the eliminated loss-making route, as well as from the re-timing of other existing flights. Resulted in an estimated 10%+ variable profit improvement, a 5% increase in fleet utilization, and an estimated 1.1% positive impact on the market share captured by the airline. Proposed "special period" scheduling measures to optimize both flying and fleeting during a busy holiday 3-week period. Costs were minimized during the slow periods and revenues maximized during the peak traveling days, resulting in a significant surge in profitability. Contact us to learn more about how we can help you identify the hidden opportunities in your network to grow customer traffic. Learn new ways to grow your customer traffic.